The GARLIC is ready to harvest! We will start this BIG project this coming Friday, July 29th at 3 pm until dusk and then get at it again on Saturday morning, July 30th, at 7 am. We have 8 long rows to get out of the ground. We'll work as long as we can on Saturday (or for as long as we have help) and then continue with the project on Monday, Tuesday, and Wednesday mornings (as help is available) or until it's all out of the ground. I extend the invitation to all our CSA members to come help on the farm. We need strong men for the digging, and ladies or older children for the bunching. Please let me know if you can come help. We've had years when this job is done in just a couple of days and other years when it's dragged on. Let's make this a year to brag about! I've had to go out and pick zucchini every morning this week to keep up with them! It's incredible how they turn on and how much they can grow on a hot day! The yellow summer squash plants are loaded with blossoms and little babies measuring a few inches. I predict they will keep me busy very soon as well. The poor "holy" Chinese cabbage "hearts" you are getting are all that's left of our entire second crop of Chinese cabbage plants. One week they aren't big enough to harvest, and the next week they are eaten down to nearly nothing. We opted to take out the entire row, salvage the inside "hearts" and make room to plant a fall crop. Report from Farmer Shain's last walk around the farm - The bean plants have blossoms. The peas do too. Carrots and beets are very close to being big enough to harvest. Our new rows of salad mix will be ready to cut from next week. Our sweet yellow Walla Walla onions are forming nice and big. The spinach is bolting (*sad face*). All the rows of crops we weeded recently have really taken off. Shain's next top priority is to plant a fall crop of spinach. Thanks to CSA member Cindy for sharing this recipe- Rainbow Slaw, using the kale in your share. She says it's one of their favorite ways to enjoy kale. Do you have recipes to share? 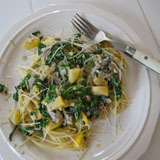 Or photos of meals you are making with your CSA share? I'd love to post them here to inspire others with great ideas for eating well with your CSA produce. Have a great week and ENJOY your veggies! Farmer Shain planting new rows of salad in "Garden 1." We are in the middle of a decline in available produce. This is your catch up week to eat all the food from previous shares and be ready for the next wave of veggies. There is much to anticipate! Meanwhile, we have used our extra time to do a lot, a LOT, of weeding! Crops that were previously covered in weeds will now have the chance to flourish and grow for our culinary enjoyment. It's a bonus to see nicely weeded rows in a few places around the farm. More crops have been planted in a few of the rows we cleared out recently. Weeding = food! Cilantro - Here's a link to a few recipes we've collected. If you need some ideas, may I suggest making Cilantro Pesto (many recipes available online). It's another of our favorites that we make in bulk and throw in the freezer. I mentioned before that it also freezes quite well. We'll just take out a "block" (ice cube square) or two and add it to fresh salsa in the winter, yummy! Farmer Shain's report: onions are starting to bulb, some tomato plants are loaded with small tomatoes and blossoms, pepper plants are starting to get peppers on them, cucumbers were caged today and look great, and the beets seem to be doing better than the carrots this year but both look good. *Last of the Season for these crops. We pulled up the last of the Japanese turnips today to make room for another planting. We also picked heavy from our last row of radishes today. They are getting buggier this time of year and it's not likely we'll get another harvest from that row. Our second crop of pac choi also had to come out this week at the baby stage. The plants were bolting at such a rapid pace that it was either give to the CSA members now or feed to the chickens later. Garlic plants have been picked clean of all their scapes. As I said, they are only available a couple weeks every year (but they can store for up to a month in your fridge). We are looking to replace one of our Workshares who had to quit due to health concerns. If you know someone who is interested, please have them contact me. They need to be able to work from 7 am to 12 noon on a Monday, Tuesday, or Wednesday. They will receive a share of produce in return. Temperatures have been threatening a freeze for the past several nights. So we've returned to a daily routine of closing greenhouses up tight and covering sensitive crops at night, and opening everything back up again and taking row covers off in the morning. Windows have been heavily frosted at least 2 mornings recently, so we know our time and efforts were worth it. I wish to remind you of the amazing Workshare crew we have coming to the farm each week to help us harvest your produce and work on other farm projects. Starting this week, all our full Workshares increased their weekly commitment and started coming 5 hours per week. They are such great workers and are essential to helping us run this farm. We literally couldn't do it without them. Speaking of help on the farm, there is always more to do than we can keep up with. So once again I extend an invitation to the entire CSA membership to come join us for a few hours at the farm. We spend Monday, Tuesday, and Wednesday mornings harvesting and other days and times on other priority projects. Right now, we'll mostly be weeding (down on our hands and knees). In a few weeks, we'll start digging up garlic, this is a big project that we'll need help with. Priorities on the farm are about the same - Farmer Shain has been planting, transplanting, and starting more seeds for fall crops. My assignment is to weed, supervise weeding, and rally more help with the much needed weeding. 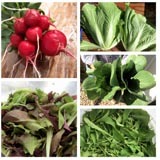 All weeding brings more great food to the CSA. We weed out a row and it gives a clean space for Shain to plant more food. We weed a row of crops that are ready for harvest and your food is of the very highest quality possible. We weed a row of new small crops and they will sometimes double in size in just a few days. Weeding = food! This is the last batch of the Romaine head lettuce that's been growing in greenhouse 6. We needed it out to plant other crops - more cukes, peppers, and basil. It's a big bag of lettuce, but typically holds well (lasts for more than a week). The individual lettuce leaves can be used for things other than making another salad. Use a leaf in place of breads, buns, tortilla's, taco shells, etc. Maybe use yours to make BLT's (with a lettuce leaf in place of the bread), or a thin spread of chicken or potato salad on a long lettuce "shell". This is a photo of my spicy chickpea taco with marinated tomatoes and guacamole. A recipe idea I forgot to share for Chinese cabbage - Cabbage Rolls (from long time CSA members Jim & Amy). A mixture of rice, veggies and seasonings wrapped in cabbage leaves and steamed lightly. Yummy! Link to recipe. We hope you are finding delicious ways to cook up your CSA share each week. Please continue to share your ideas, recipes and photos. All but one row of our scapes are picked now. Please remember that they will stay fresh in your fridge for weeks in a loose plastic bag (not air tight, needs a little ventilation). They can also be frozen or dehydrated for later use. This is your "big batch" so do something with them (I can't say enough about the garlic scape pistachio pesto) or store them properly for maximum long term use. Just a heads up on a easy way to preserve extra herbs - coarsely chop, mix with a minimal amount of water, and freeze in ice cube trays. The chopping can be done by hand with a sharp knife, in a blender, or in a food processor. Very quick. Very easy. I use this method every year and am able to enjoy fresh cilantro and parsley all winter. Produce we hope to have in next week's share: kale and spinach. Some of our tomato plants have baby tomatoes! Zucchini and squash plants are loaded with blossoms. Weeding party at my place this coming Saturday, July 9th, 8 am to 12 noon. RSVP.